During PM Modi's US visit in June 2016, US recognised India as a "Major Defence Partner" which commits Washington to facilitate technology sharing with India. New Delhi: Early implementation of a secure communication line between Minister of External Affairs of India and the U.S. Secretary of State and between the Minister of Defence of India and the U.S. Secretary of Defense was the main focus of recent phone conversation between the defence minister Nirmala Sitharaman and Acting United States Secretary of Defense Patrick M. Shanahan. 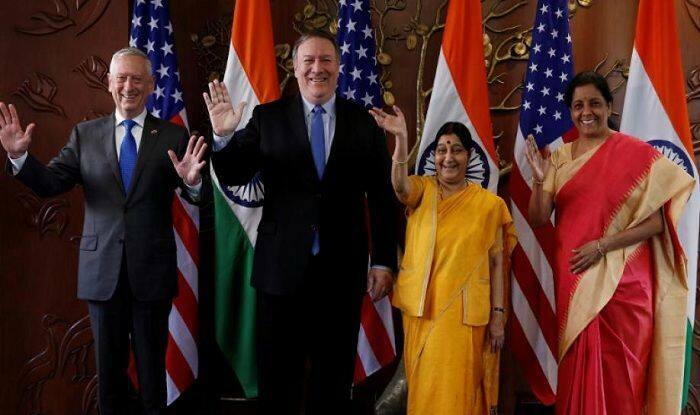 During the 2+2 dialogue, India and US signed the Communications Compatibility and Security Agreement (COMCASA) which will help New Delhi get access to advanced US defense systems and enable it to utilize its existing U.S.-origin platforms. Last year, Washington also granted New Delhi Strategic Trade Authorisation-1 (STA-1) status which will help India get high-end US technology for defence purposes with ease. India is the 3rd Asian country after Japan and South Korea to get the STA-1 Status. During PM Modi’s US visit in June 2016, US recognised India as a “Major Defence Partner” which commits Washington to facilitate technology sharing with India. Under the Defence Technology and Trade Initiative (DTTI), both New Delhi and Washington are also exploring the possibilities of co-development and co-production. Last year in December, Nirmala Sitharaman was on a 5 day US visit during which she met with the then, US Secretary of Defence James N Mattis and visited the headquarters of the INDO-US Pacific Command (INDO-PACOM) in Honolulu, Hawaii. She had also visited Joint Base Pearl Harbour Hickam and boarded a US Guided Missile Destroyer.US Pacific Command (PACOM), which is the largest US command, was renamed as INDO-PACOM as part of Indo Pacific concept which is being supported by both US & India.